Markets are trying to catch their breath after the strong run in October. We may see another rally attempt this week, but I think we are going to get more of a pullback before stocks go higher again next year. With many indexes near their all time highs again a lot of investors will probably take some profits. The S&P is bumping into overhead resistance in the 2100-2130 area. Technically the the fast Earl (blue line) is showing a bearish divergence while the slower Earl2 (orange line) is finally flattening out at a very high level. This is the kind of setup that normally starts a pullback of 4 to 6 weeks. So, if stocks try to climb again this week it will be a chance to take some profits. 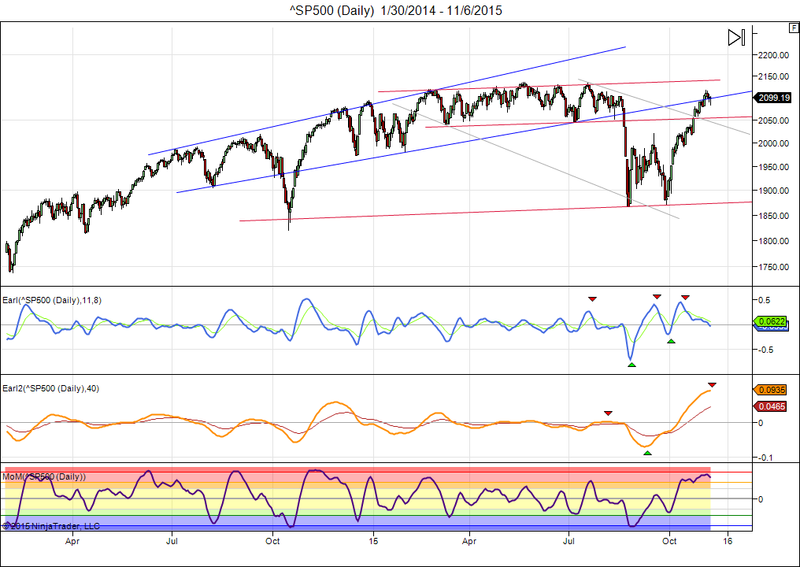 Next week we will start a new lunar red period and I think the S&P will use it to retest the 2050 level. This entry was posted on November 9, 2015 at 2:19 pm	and is filed under Financial Astrology. Tagged: lunar cycle. You can follow any responses to this entry through the RSS 2.0 feed. You can leave a response, or trackback from your own site. Hi Danny, does the price work out the bearish divergence as shown by the fast earl blue line? Looks like the divergence starts around the 2000 level. The price at which divergence starts is not necessarily an indication of how low a correction will go. It may be very shallow and it may fall well below 2000. Market keeps going up because slower Earl2 has kept rising. But now it is turning down. So, further gains will not come so easy until Earl2 bottoms out again.. Thanks, Danny. Excellent and very useful analysis.